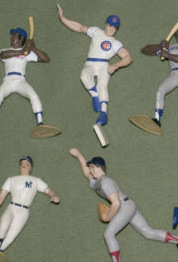 I came across this image of a Ryne Sandberg Starting-Lineup figure. The ebay seller photographed the figure at a really intriguing angle. Ryno is no longer sliding into second (or third) base. He is now keeping his balance while standing one-legged on a base turned on its side. In fact it looks like he’s doing some sort of old Russian dance. Wow. Surely that’s the work of a Hall of Famer and the greatest second baseman of all time. Way to go, Ryno!